Pedigree® Dentastix™ Twice Weekly chews are scientifically proven to reduce the build-up of plaque at the gum line, where it matters most. This is thanks to their revolutionary texture that flexes around teeth, giving a deep clean. PEDIGREE Dentastix Twice Weekly Small Dog Dental Chew 3pce is rated 4.5 out of 5 by 89. Rated 1 out of 5 by Miss piggy from I DO NOT RECOMMEND THIS PRODUCT I Bought this in the small as i only have a jack russell and this morning he was chewing away at it and it got caught in his teeth it wouldn't move it took a while to get out thought i was going to have to take him to the vets to get removed, so I'm sorry but I WILL NOT BE BUYING THESE AGAIN!!!! Rated 5 out of 5 by Jojo123 from Great product!! My little 5yr old Pomeranian has never liked DentaSticks, so when I saw DentaFlex I was apprehensive, but noticed it had a softer texture which I thought would suit my little Pom better. I cut it in half and she went mad for it, it lasts her ages, she can sit there for hours chewing it, but so far half a stick has lasted nearly a week and she has some left. I'm so happy to finally have a dental product that my dog likes! Rated 5 out of 5 by Jonesy from Dogs love it and it works! We have bought DentaFlex for the last two month. 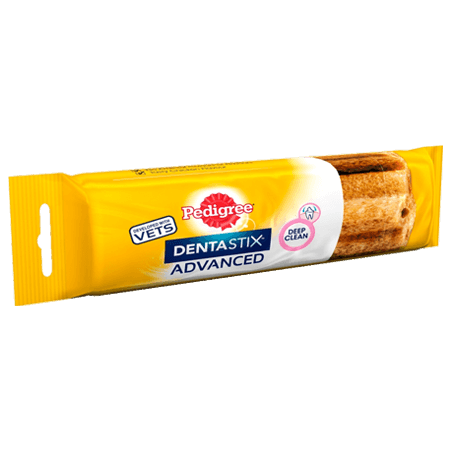 Dogs loved it and they definitely last longer than a DentaStix. Noticed bleeding at the start when using it, but was not concerned at all. Reminded me of a human going to dental hygiene and getting all teeth cleaned - gums bleed. Sure enough, not noticing any bleeding anymore. Love giving it to our dogs when I leave home for longer. Keeps them busy and happy til I am really gone. Absolutely safe to use in my and my dog's eyes! Rated 1 out of 5 by Ksuth99 from Gums become bloody and inflamed Bought these dentaflex's for both my dogs one large and one medium to match with the size of my dogs! Well thee dogs love them but as they are chewing away I see that the ends are becoming increasingly red!! The dogs mouths are both bleeding!! I have it on very good veteniary authority that my dogs DO NOT have gum disease. I do not recommend you buy these as they seemed to shread the top layer of both the dogs gums!!! Also didn't last 2 minutes they are not long lasting!! Rated 5 out of 5 by Joshpaws from Old dog revitalised Murphy is a 16 year old Lhasa. Blind, deaf and very few teeth left. So I didn’t offer him one of these, after all, what could he do with it? Undaunted he STOLE it from our young dog and set about demolishing this Chew with vim and verve and a joie de vivre I’ve not seen for a long time, even growling at the young dog who tried to retrieve his treat. What on earth are in them? I’m utterly amazed. And why can he only have two a week? I have a short video I’d love to share but can’t work up how to upload it. Rated 5 out of 5 by nadia1976 from teeth magic I didn't expect them to be so big when I received it, my dog Rocky got the small and it was quite a big treat. Although it didn't pose any kind of problem to him, since he loved getting his teeth stuck in, and was well entertained for a while until he ate it whole. He loved it, it lasted longer than any others I've tried before so I will definitely buy it again! Great way to keep the tartar away and give him healthy teeth. Rated 4 out of 5 by cezaweza from Must be tasty as was wolfed down! I gave the Dentastix dental chew to my King Charles Cavalier dog who sometimes has issues with his teeth. The chew was gobbled up quickly so must have been very tasty! I could see that he was biting into it quite a lot as it is very thick and so it was rubbing against his teeth and hopefully contributing to their health. The only downside was it was a little too wide for a small dog and he struggled with it a little bit. Small dogs, e.g. a Dachsund, feed 2 chews per week. This is a chewy treat which is only suitable for dogs between 5kg and 10kg. It is not suitable for young puppies under 4 months. 2 chews provide 11% of the weekly energy requirements of a 5kg dog. Please reduce main meal accordingly. Use within 24hrs of opening. Fresh drinking water should always be available. Store in a cool dry place.